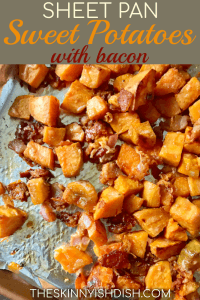 These Roasted Sweet Potatoes with Bacon and Parmesan are sure to make your taste buds do a little happy dance… right on top’a the dinner table! 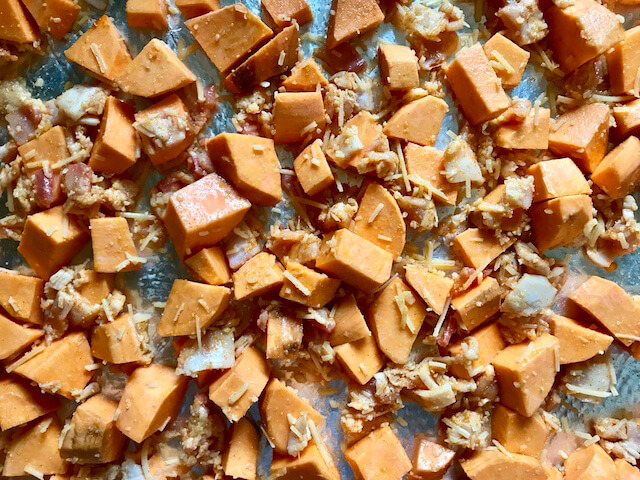 Here’s what’s in store for you- cubes of sweet potatoes that are soft in the center, and crispy on the edges… a little diced, center-cut bacon… some grated Parmesan for good measure, and just a kiss of onion, ground cumin, and smoked paprika to wrap it all up. In a neat little present for your mouth, with a bow. Trust me- make these. T-MINUS TEN DAYS TIL THANKSGIVING, Y’ALL! What are you throwin’ on your Thanksgiving tables? I still haven’t decided what I’m bringing to Thanksgiving. I’m pretty sure these Roasted Sweet Potatoes are going. 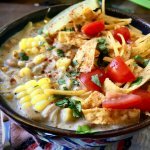 I run a food blog, but I’ve never hosted Thanksgiving. I’m not full of a ton’a tips and tricks like I wish I was because, to be honest, I still rely on mama to take over Thanksgiving. I have no shame about it. I’ll shout it from the rooftops, because I’m more than happy to hand over roasting a big ol’ bird to someone else. It’s a legitimate fear of mine to cook a giant Turkey! I do, however, lend a hand with making side dishes. Yep! I’m all about them side dishes. So I’ll continue to do my part by using my creativity to dream up yummy sides each year. Listen to this: Eric hates sweet potatoes. scratch that, he looooooathes sweet potatoes. Because of this, I’ve never done much with’m, because I don’t wanna hear him whine about how they are the worst. I don’t dislike the things, and I’ve never been deeply in love with them. That all changed the day I threw this recipe together… All of it. The sweet pahtoodle heavens opened up, guys. Eric completely enjoyed a plate full of these Roasted Sweet Potatoes next to some spicy roasted chicken breast! The thing is, they’re sooooo sweet, they need a lil’ balance… They need salty, they need flavor. 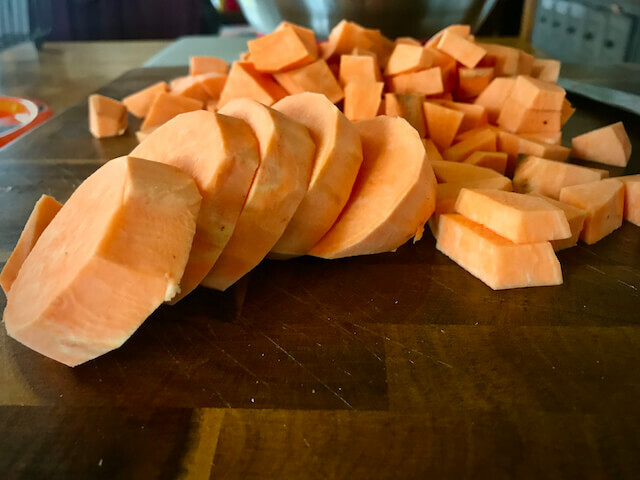 Please don’t hate me for this statement- the very last thing a sweet potato needs is more sugar and marshmallows. I know, I know. Opinions are like… well, never mind. I really believe it though… neither of us has ever met a sweet potater casserole that we really liked. To us, it was a dessert! It belongs on a dessert table. 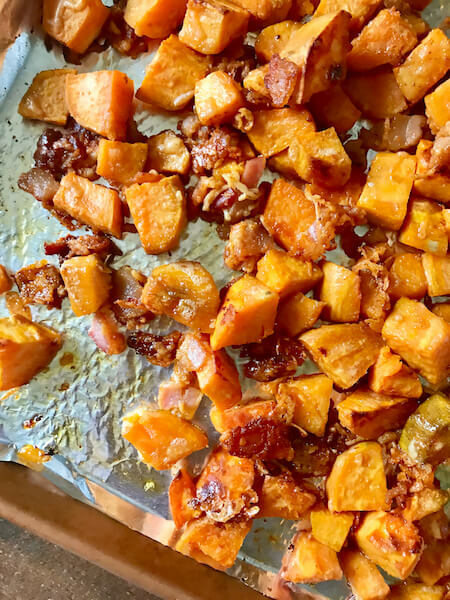 Now that I’ve finally broken our aversion to sweet potatoes, this recipe will definitely be on the dinner table more often than not. I hear that they’re very healthy, good for your skin and bones and stuff. Plus… bacon. What’s not to like? We just love’m. Let’s get into the kitchen! Preheat yer oven to 425 degrees. 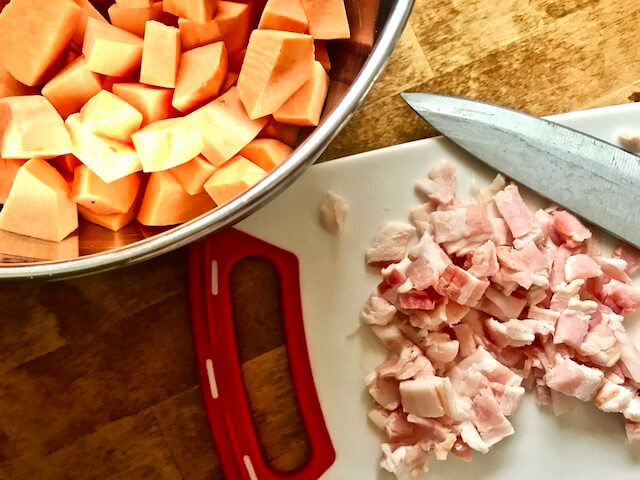 Then, cut up 1.5 pounds of sweet potatoes into small, bite-size cubes. Now dice up 5 slices of center-cut bacon. Try to make it kinda-sorta small, so it moves around and distributes better throughout the dish. 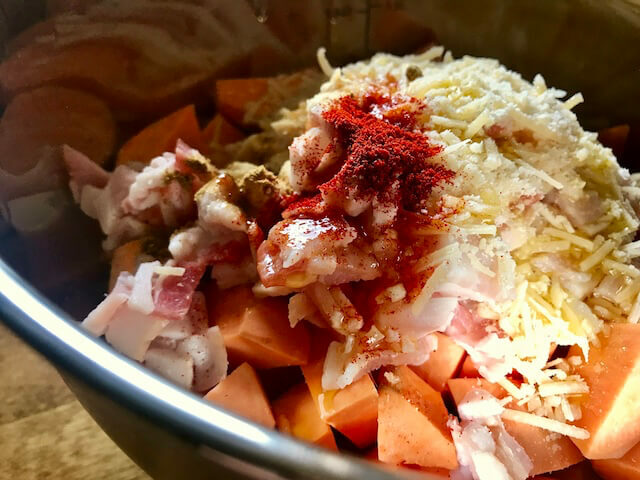 Add goodies to your taters: The diced bacon, 1/4 cup grated Parmesan, 1 tsp garlic powder, 1/2 tbsp olive oil, 1/2 tsp kosher salt, 1/2 tsp onion powder, 1/2 tsp smoked paprika, and 1/2 tsp cumin. 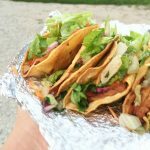 Trust me when I say this- the addition of cumin is magical, and it will not make you think Mexican food. 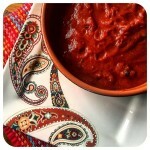 I don’t know why I decided to throw cumin in this recipe, but I’m so happy I did. Spread the magical mixture onto a large sheet pan, and spray that baby with some olive or avocado cooking spray. Place’m into the oven, and let that oven do its mystical oven thing where stuff turns instantly delicious, and caramelized, and perfect. 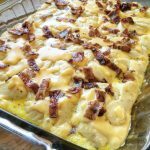 Let’m go for about 25-30 minutes… right up until the moment the bacon looks crispy, and those taters are just a lil brown and crispy on the edges. And can you believe this- we’re done. So easy! And so GOOD! I’m not going to hold it against you if these just can’t replace your sweet potato casserole for turkey day, but will hold it against you if you don’t add these to your dinner plate on some random Thursday evening. Because dang it, they are just delish! 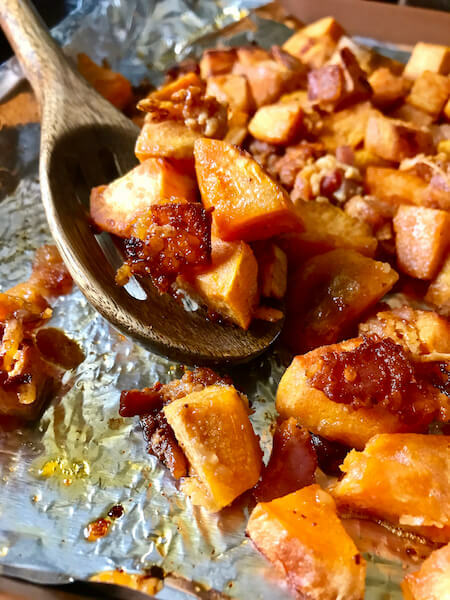 Roasted sweet potatoes coated in parmesan cheese, spices, and lil bits of diced bacon. 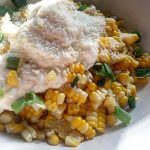 A new favorite side dish that is easy and delicious! Preheat oven to 425 degrees. In a large bowl add potatoes, bacon, parmesan, all spices, and olive oil. Mix together very well. Place aluminum foil on sheet pan and light spray. 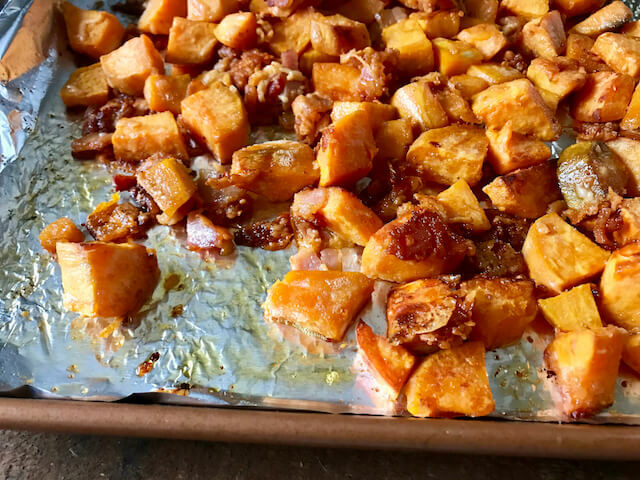 Place the coated sweet potato mixture onto sheet pan and spread evenly. Spray the top of the potato mixture with a little more cooking spray. Freestyle Points: 3 | Calories: 106. Fat: 2.5g, Saturated Fat: .5g, Carbohydrates: 17g, Fiber: 2.5g, Sugar: 3g, Protein: 4g. 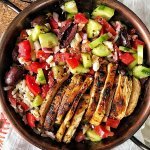 The Skinnyish Dish is a participant in the Amazon Services LLC Associates Program, an affiliate advertising program designed to provide a means for us to earn fees by linking to Amazon.com and affiliated sites. I made these and they were delicious. 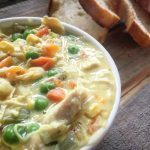 My husband loved it and said this recipe is definitely a Do Over! I especially loved the crunchy bits of parmesan that were on the pan. My potatoes came out very soft once they were cooked. I wish there was a way to crisp them up a bit. 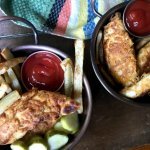 I may try this recipe in small batches in the air fryer. This was so SO good. The flavors were so well balanced. 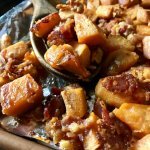 My husband also dislikes sweet potatoes and I almost couldn’t get him to try. He ended up eating several helpings and said I should definitely make it again. Thank you! I’m so happy y’all enjoyed, Stacey!!! Thanks for stopping by to rate it and let me know! I made this last night and it was amazing! 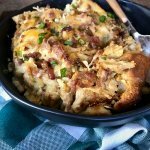 My husband and daughter loved it and they agreed with me that it will definitely be on our Thanksgiving menu. 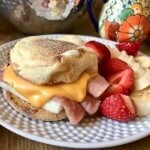 THANK YOU for another fantastic recipe!